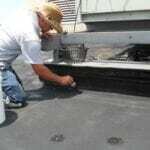 Built-up Roof repair (BUR) requires a seamless membrane systems to stop a BUR roof leak now. 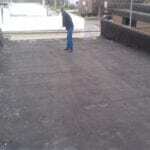 The typical bitumen used in BUR roof systems are overlapping rubber membrane sheets covered with asphalt, coal tar or cold-applied adhesive to the seams. BUR’s are typically topped with rocks or gravel as well, but use a thin layer of pea gravel or crushed stone as opposed to much larger stones in a ballasted roof. A majority of leaks and built-up roof repairs will occur at flashing details – anywhere the membrane itself has a seam or meets a non flat surface. BUR roof systems are not fluid-applied like seamless roofing systems so they cannot be custom installed and tailored to meet the particular issues of each individual roof – like flashings, vents, HVAC units, etc. A built-up roof repair is recommended around penetrations and the edges of the building to stop leaks but that will only result as a short-term fix. Surface spudding, repairs and installation of a seamless roofing system will make your roof stronger and more durable than the day it was installed. Don’t wait for a built-up roof leak. Contact Austin Roofing & Waterproofing today to transform your flat roof into a seamless, eco-friendly, fire retardant and energy saving flat roof system! TRITOflex™ seamless liquid rubber roofing system is ideal for retrofitting an old built-up roof when it is leaking or deteriorated in order to avoid a costly, disruptive, and dangerous tear-off. TRITOflex™ is lightweight at only 6 oz. per square ft. and is quickly spray applied to any thickness in one coat directly over the existing roof. The liquid rubber product forms a fully adhered seamless rubber membrane without the need for thousands of screws to hold it down like the most popular single-ply recover option. When completed with a TRITOtherm reflective top coat, it becomes a highly energy efficient roof as well.